If you appreciate family-run businesses and longevity, you will love Tauck. Arthur Tauck Sr., son of a German immigrant, found the American dream in 1925 when he started Tauck Motor Tours. His first tour included an exploration of the back roads of New England. It's been more than 90 years since that first tour, and three generations have developed the Connecticut-based company, which has been a pioneer in escorted travel. Tauck now offers more than 140 unique escorted tours to all corners of the globe. Its tours include small-ship and river cruising, land tours, safaris and family-friendly vacations. Arthur Tauck Jr. is currently Chairman of the Board while his son-in-law, Daniel W. Mahar, is CEO and Board Director. Liz Tauck Walters also sits on the board. Robin Tauck is Past President and CEO, and Peter Tauck is a Past Co-President. Kiki Tauck Mahar played a vital role in creating Tauck Bridges, the company's line of family-friendly tour options. An elegant small ship chartered by Tauck for select destinations around the world; French onboard ambiance for a unique experience. Passengers sailing on Tauck itineraries tend to bond quickly. That's partially because transit is always on an intimate ship and because travelers tend to have similar interests that lead to quick friendships. Tauck Directors are also engaging individuals and lead onboard discussions and shore tours most days. The shared camaraderie is felt from day one, and everyone is genuinely excited to see how the vacation unfolds. Tauck's level of inclusivity also fosters a sense of exclusivity. You may pay a bit more for your voyage, but it will include services and experiences that you couldn't get if you didn't book through Tauck. Your fare will generally include airport transfers, a pre- and/or post-cruise hotel stay with guided sightseeing, all shore tours, internet access, gratuities (for ship's crew, the Tauck Director, local guides and drivers), port charges and onboard beverages. Even shoreside meals are packaged into the price. You'll be treated to personalized service and will bond with other Tauck travelers during complimentary events like onboard cocktail parties and on-deck gatherings during sail-aways. Among Tauck's other main selling points is the fact that its ships can go where the big ships can't. The company also provides uncommon access to the most compelling sights onshore. For example, in Rome cruisers are treated to a special after-hours visit to the Vatican Museums and the Sistine Chapel. Seeing these bucket-list sights without the crowds is nothing short of spectacular. Destination immersion is another facet of Tauck Small Ship Cruising that gets high marks. The company programs an array of excursions that help travelers really get to know a place and meet some locals. That might mean a guided walk across the Arctic Circle in Grimsey, Iceland, followed by a visit to a family farm, or lunch at a Peruvian Paso horse ranch and dinner at a private home in Lima that dates back to colonial times. A Tauck Director always leads shore tours, along with knowledgeable local guides, and is available to answer questions and provide unique insights into every stop along the way. Tauck doesn't simply rely on its own expertise, however. Tauck has partnered with BBC Earth natural history experts to develop exotic voyages called Earth Journeys. Onboard, you'll watch special Tauck film vignettes about the destinations you'll visit and attend in-depth enrichment lectures that give more context to the upcoming experience. You'll also get to play with various pieces of field equipment provided by Tauck Directors and local guides. Depending on your itinerary, that could mean putting an FLIR thermal-imaging camera to work, trying out a GoPro video camera or utilizing special microphones that can pick up underwater sounds. Earth Journeys focus on Tauck's more exotic itineraries with visits to Antarctica on Le Soleal or Le Boreal; the Panama Canal and Costa Rica aboard Star Pride or Star Breeze; and Peru and the Galapagos Islands or an in-depth exploration of just the Galapagos Islands aboard Isabella II. No matter where you wish to sail, Tauck probably has an itinerary that will fit your bill. Tauck Small Ship Cruising offers tours to Antarctica, Asia, Australia and Europe, and it also offers Panama Canal transits and trips to the Galapagos Islands. Itineraries often include a mix of land-based accommodations and a cruise ranging in length from six to 10 nights. Tauck says that "inquisitive seekers of knowledge" are drawn to its small-ship cruise itineraries. Passengers are primarily well-traveled Americans who can afford the best when it comes to their vacation options. You'll travel with like-minded individuals who want an intimate oceangoing ship that can visit both off-the-beaten-path and marquee ports of call. Every passenger is invested in learning about each destination's culture and is passionate about immersion travel. On any given Tauck expedition, you'll meet solo travelers, couples and families (although mainly of the older, multigenerational variety). Families wishing to travel with Tauck should look specifically at Tauck Bridges, itineraries crafted with children in mind. Tauck Small Ship Cruising charters vessels -- from masted sailing ships to intimate yachts -- from other cruise lines in order to form its fleet. Currently, Tauck is "borrowing" ships from three cruise companies: Ponant, Windstar Cruises and Metropolitan Touring. Most often, Tauck charters part of the ship so while you'll enjoy cocktail parties, enrichment lectures and shore excursions with your group, there will be other travelers onboard who booked directly with the cruise line. Those passengers won't have access to everything Tauck provides -- like destination specialists and some meals on land -- and their cruise fares are often less inclusive. For example, when Tauck passengers sail aboard a Windstar ship, they can enjoy complimentary happy hours and wine with dinner nightly. Non-Tauck passengers who booked with Windstar have to purchase a beverage package in addition to their cruise fare. Tauck also includes pre- and/or post-cruise hotel stays in its fares. 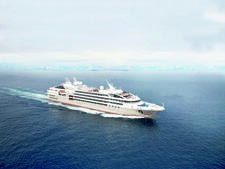 Tauck charters five ships from Ponant: Le Ponant, Le Boreal, L'Austral, Le Soleal and Le Lyrial. The 850-ton Le Ponant is a wonderfully intimate, 60-passenger, three-masted motorsail yacht. The other four ships are all traditional yachts with ice-strengthened hulls (for sailing the world's polar regions) that come equipped with a fleet of Zodiacs for active exploration and wet landings. All of the yachts measure between 10,944 and 10,992 tons and all -- with the exception of Le Lyrial -- accommodate 264 passengers at double occupancy with 140 crew. (Le Lyrial accommodates 260 passengers.) Le Lyrial, Ponant's newest ship, debuted in 2015, while Le Soleal, L'Austral and Le Boreal set sail respectively in 2013, 2011 and 2010. Tauck also charters space on four ships from Windstar Cruises: Wind Star (one of its motorsail-yachts) and its three more traditional cruise ships, Star Pride, Star Breeze and Star Legend. Wind Star, at 5,307 tons, is a four-masted yacht that welcomes 148 passengers with a crew of 90. The ship was built for Windstar and launched in 1986. Since that time, the ship has undergone continual maintenance as well as several stem-to-stern refurbishments. The three 9,975-ton yachts that Tauck charters were all previously part of Seabourn's fleet and joined Windstar in 2014 and 2015. All three Windstar yachts welcome 212 passengers with a crew of 145. For its trips to the Galapagos Islands, Tauck charters the 40-passenger Isabella II and the 90-passenger Santa Cruz II from Metropolitan Touring. Isabella II is a 1,025-ton expedition yacht that was originally launched as a supply ship in 1979 and rebuilt for Metropolitan Touring in 1998. The ship is refurbished regularly, with its most recent dry dock in 2012. Santa Cruz II, weighing in at 2,664 tons, was originally known as Mare Australis and sailed for Australis when it launched in 2002. Metropolitan Touring bought the ship in 2015 and oversaw a complete refurbishment. If you're traveling with children, select one of Tauck Bridges' itineraries aboard Santa Cruz II that are specially designed for families. Offered during peak school vacation periods, the guides and naturalists on these voyages tailor their presentations for children and schedule special hands-on immersive activities such as onboard cooking or art classes.